Billy Goate of Doomed & Stoned has uploaded video footage of EYEHATEGOD's October 7 performance at Dante's in Portland, Oregon. Check out the clips below. 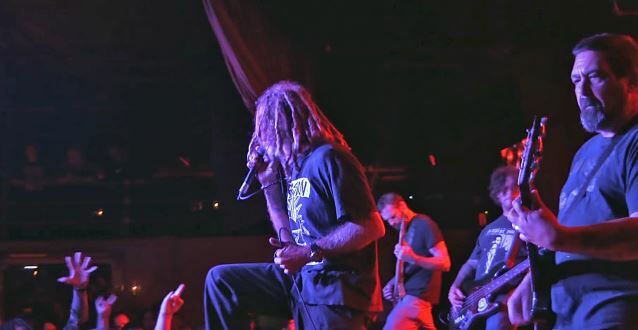 As previously reported, LAMB OF GOD's Randy Blythe is filling in for EYEHATEGOD vocalist Mike IX Williams on the latter band's tour with DISCHARGE and TOXIC HOLOCAUST. Commented Williams: "Once again, rather than cancel an amazing tour, we have chosen for EYEHATEGOD to continue on and give one thousand percent. "This 2016 DISCHARGE tour is super important to me as that band has been a huge influence on my life, but my health situation right now dictates that I am not able to take the stage and perform to the best of my abilities every single night. This is where our good friend Randy Blythe from LAMB OF GOD comes into the picture. "We've known Randall since the early '90s when EYEHATEGOD would pass through Virginia and he'd offer for us to crash at his crib after our gigs. Great times and we became great friends. To have Mr. Blythe on board as a fill in for me on vocals for this run is a true 'circle-stays-unbroken' turn of events! "Coming off the heels of Philip Anselmo doing vocals for EYEHATEGOD on two high-profile shows [last month's performances at Southport Music Hall in New Orleans, Louisiana and the 2016 edition of GWAR BQ in Richmond, Virginia respectively], both of these men are at the top of their game. "I am getting the medical help I need and will return to the band as soon as possible. Thank you, everybody... "
Added Blythe: "Anyone who knows me well knows that I am a massive EYEHATEGOD fan. 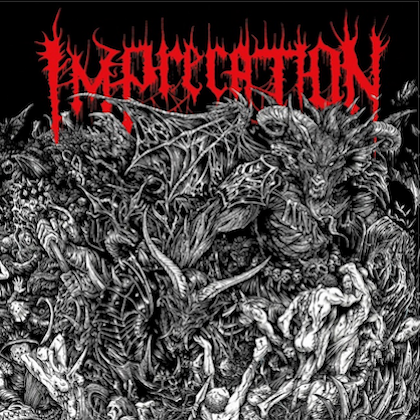 I've seen them play more times than I can remember, my old side project covered 'Dixie Whiskey' for an EYEHATEGOD tribute album, I wear their merch, I even have a freaking EYEHATEGOD tattoo that I got in New Orleans. They are one of my favorite bands of all time, period. I've also been friends with the guys in the band since the '90s... actually, I knew them before I knew the dudes in my own band, and EYEHATEGOD would often crash at my crib when they came through Richmond. So it's a bit difﬁcult for me to say, 'I'm super-happy that I've been asked to ﬁll in for Mike IX Williams on this upcoming tour with DISCHARGE and TOXIC HOLOCAUST.' In fact, I can't honestly say that at all because, once again as a fan and, more importantly, a friend, no one would rather see Mike do this tour more than myself. Mike IX is THE voice of EYEHATEGOD, and I respect him as a friend, musician, and writer way too much to ever think otherwise. What I can say is that I am beyond honored to be serving a brief tour of duty on vocals with EYEHATEGOD for this run. "I know from talking to him that Mike is very, very bummed to not be on this tour, especially given the fact that the legendary DISCHARGE is one of his all-time favorite bands. In light of that fact alone, it's a huge testament to the man's character that he's being gracious enough to let the band continue to work while he concentrates on his medical issues, which are entirely legitimate and prevent him from taking the stage night after night. "The other guys need to keep the band alive while IX gets better. As anyone who has ever seen the band can attest, the stage of an EYEHATEGOD show isn't exactly the ideal place to rest and recuperate from an illness, and that is the most important thing here: that Mike IX gets better. "In order to both give him the time to take care of his health while simultaneously keeping EYEHATEGOD an active working unit, I'll be proud to do my bit on this tour and take the stage with what is undeniably one of the heaviest bands on earth. It will be a savage experience; I can promise you that. Let the down-to-earth-motherfuckin'-post-ampliﬁcation blues begin! Hail Mike IX." 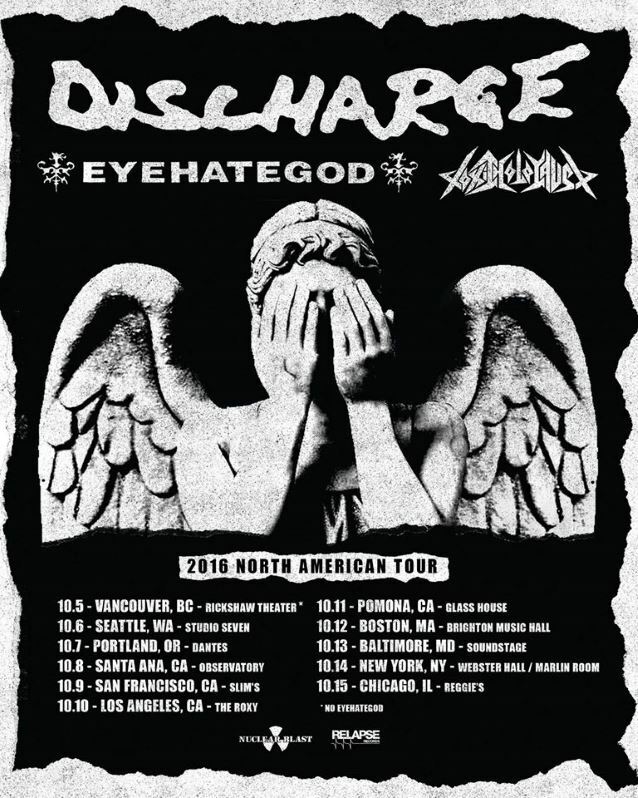 EYEHATEGOD's journey with DISCHARGE and TOXIC HOLOCAUST commenced on October 6 and will run through October 15, the tour concluding with a one-off show in Chicago with NEGATIVE APPROACH and SVLPHVRVS.